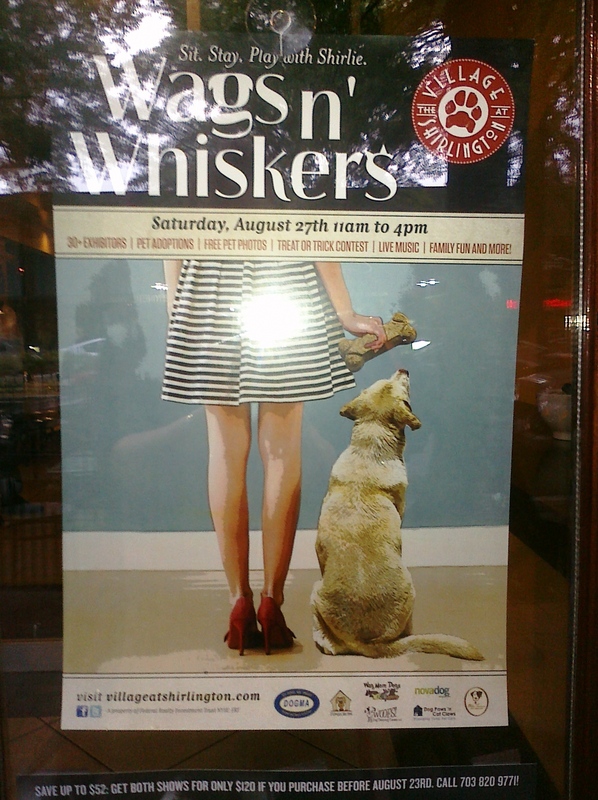 This Saturday, dog-friendly Shirlington Village gets even friendlier as it holds a celebration of pets with the 4th annual Wags & Whiskers from 11:00 a.m. to 4:00 p.m.
More than 30 exhibitors, pet adoptions, free pet photos, a treat or trick contest, live music and more highlight this street festival. Right now the Washington Post’s Capital Weather Gang is predicting that Hurricane Irene will reach our area starting Saturday afternoon, so plan on hitting Wags & Whiskers early! For those of us who love our dogs like children, a heartbreaking story about a soldier who loved his dog so much he called him his “son” has been making the news the past few days. Navy SEAL Jon Tomlinson died during the insurgent attack in Afghanistan that took the lives of 30 troops, including 22 Navy SEALs, on Aug. 6. At his funeral in Iowa, his Labrador Hawkeye laid by his casket throughout the entire service, unwilling to leave his master’s side even in death. Read the whole story and see the incredibly moving photo of Hawkeye on the Today show’s website.